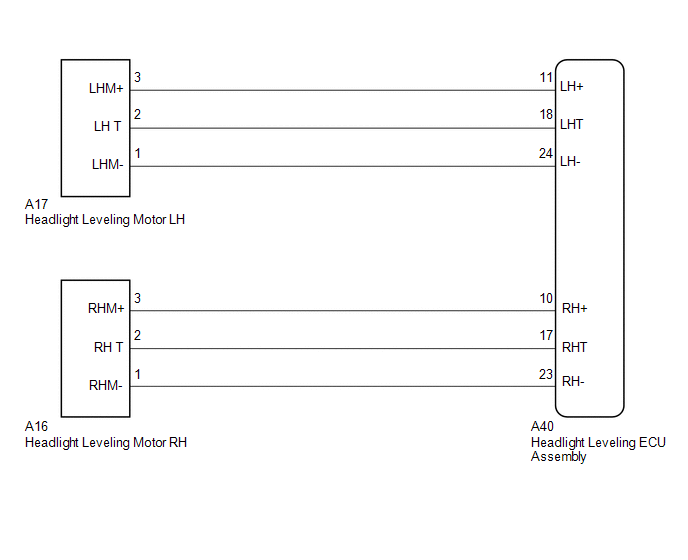 The headlight leveling ECU assembly actuates the headlight leveling motor according to vehicle conditions. (d) Enter the following menus: Body Electrical / HL Auto Leveling / Active Test. (e) Check that the motors operate. Headlight leveling motors operate normally. (a) Disconnect the A40 headlight leveling ECU connector. (b) Disconnect the A17 or A16 headlight leveling motor connector. (a) Temporarily replace the headlight leveling motor with a new or normally functioning one (See page ). (b) Perform the Active Test of the leveling motors.